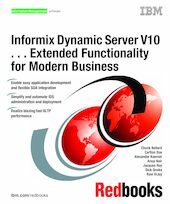 This IBM Redbooks publication provides an overview of the Informix Dynamic Server (IDS), Version 10. IDS provides the reliability, flexibility, and ease of maintenance that can enable you to adapt to new customer requirements. It is well known for its blazing online transaction processing (OLTP) performance, legendary reliability, and nearly hands-free administration for businesses of all sizes--all while simplifying and automating enterprise database deployment. Version 10 offers significant improvements in performance, availability, security, and manageability, including patent-pending technology that virtually eliminates downtime and automates many of the tasks that are associated with deploying mission-critical enterprise systems. New features speed application development, enable more robust enterprise data replication, and enable improved programmer productivity through support of IBM Rational development tools, JDBC 3.0, and Microsoft .NET as examples. Version 10 provides a robust foundation for e-business infrastructures with optimized Java support, IBM WebSphere certification, and XML and Web services support. Ready for service-oriented architecture (SOA)? This book also includes descriptions and demonstrations of support that are specific to IDS for an SOA.